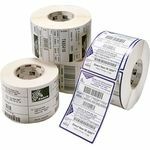 Genuine Zebra GK420d direct thermal labels for use with Zebra GK420d direct thermal label printers. Core size - 25mm. GK420d printers uses Direct Thermal labels.